Nocturnity Events, Lady A’s Vampire Social Club, SinisterVisions, the Nightshade Vampire Boutique, and the Vampire Court of Austin announce initial lineup for the inaugural Austin Vampire Ball. Austin, Texas — Nocturnity Events and the Vampire Court of Austin, in conjunction with Lady A’s Vampire Social Club, Sinister Visions, and the Nightshade Vampire Boutique, have formally announced the preliminary lineup for the inaugural Austin Vampire Ball. The Austin Vampire Ball, which will take place October 17th through October 20th, 2013, is the first of its kind in the Bat Capital of Central Texas and promises a decadent weekend of live music, wine tastings, a traditional masquerade ball, a costume contest, as well as many other additional events to keep their patrons delightfully occupied throughout their stay. This year’s theme, the Bad Moon Masquerade, will consist of two main nights of music at the legendary alternative nightclub Elysium (705 Red River Rd. Austin, TX, 78701) in downtown Austin. 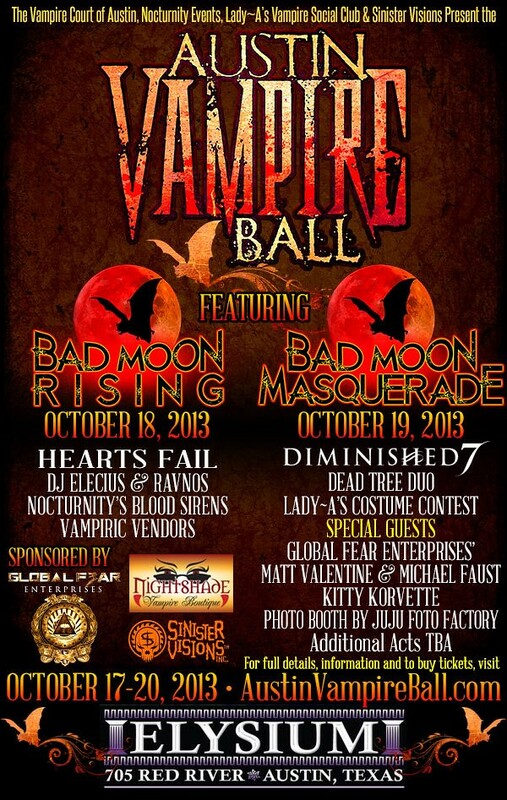 Friday October 18th, will be the opening “Bad Moon Rising” event featuring music by DJ’s Ravnos and Elecius, Hearts Fail, and “horror burlesque” by the Blood Sirens. Earlier in the afternoon on Friday patrons may also partake of a special wine tasting at Uncorked with music by Solomon Schneider of Dear Lioness. The following evening, Saturday, October 19th, will be the traditional masquerade event, the “Bad Moon Masquerade”, and will feature music by Dead Tree Duo, Diminished 7, DJs Ravnos and Elecius, a costume contest hosted by Lady A, as well as another headlining act yet to be announced. Global Fear Enterprises with Matt Valentine and Michael Faust (both past contestants on the SyFy Channel’s “Face Off”) will be Official Sponsors of the 2013 Austin Vampire Ball. They will be contributing special prizes to the Costume Contest, as well as actors in special effects makeup which attendees of the Ball will be able to take their photos with! In addition the Austin Vampire Ball will be teaming up with the legendary haunted house experience House of Torment to bring additional actors and atmosphere to the Bad Moon Masquerade this year. Both nights will also include a special VIV area (Very Important Vampire), which will have bottle service, a private bar, catered food, and more. The VIV Ticket includes a special VIV registration swag bag, tickets to the Museum of the Weird and the Haunted ATX Hearse Tour, access to the VIV section at both the “Bad Moon Rising” and “Bad Moon Masquerade” nights, entrance into the afternoon wine tasting on Friday, and an autographed photo of the Vampire Court of Austin. Tickets are now on sale for the Austin Vampire Ball at http://www.austinvampireball.com. A full schedule of events, which is being updated daily, is also available on the official website. Registration will commence at the Museum of the Weird (http://www.museumoftheweird.com on Thursday, October 17th. The weekend will conclude with a late lunch/early dinner at the legendary Moonshine Grill.